In a somewhat unexpected move, American Idol announced yesterday that comedian/talk-show host Ellen DeGeneres would be AI's fourth judge, taking the spot vacated by Paula Abdul this past July. Some fans are keen to see how Ellen will do, while a seemingly equal split of viewers feel this is a bad choice. 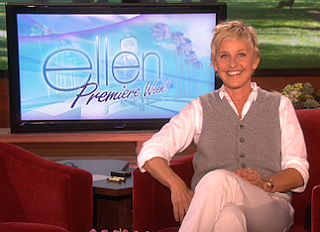 "Hopefully, I'm the people's point of view because I'm just like you," Ellen says. "I sit at home and I watch it, and I don't have that technical ... I'm not looking at it in a critical way from the producer's mind. I'm looking at it as a person who is going to buy the music and is going to relate to that person." I love Ellen, but I feel this is a weird choice, given that she doesn't have any musical background at all. I can't help but expect that her segments will just be a constant stream of jokes rather than any real, useful commentary or criticism. It's like they're admitting that this show was never really about musical talent but just entertainment value -- which is true, but at least before they (and we) pretended. I totally dig what you're saying here, and I am hoping she won't fall into that trap. I have often thought that I'd make a good Idol judge, for just the reasons she stated she would be. While "professional" judges are needed, you do need "real people" feedback as well, and hopefully that will sway some voters from voting for some lame ducks.